Manchester United and Liverpool will meet for the first time in a European competition when they face each other in the last 16 clash of the Europa League on 10th March. The Manchester United-Liverpool rivalry is one of the biggest in the world – with a viewership of around 500 million people. Both Liverpool and Manchester United are having forgettable Premier League seasons, and a top 4 finish seems difficult to achieve at this point. Hence, winning the Europa League could enable them to qualify to the Champions League in the upcoming season, and this match will indeed be crucial for both teams. United, in their recent clashes with Liverpool, have won their last four encounters in the Premier League, but the Anfield outfit are coming into form under Jurgen Klopp and with the Red Devils facing an injury crisis, it could be to Liverpool’s benefit. Manchester United and ‘injuries’ have almost become synonyms now. They are still without captain Wayne Rooney – who scored the winner at Anfield in the league meeting last month – due to a knee injury, as well as Bastian Schweinsteiger (knee), Ashley Young (groin), Antonio Valencia (ankle), Luke Shaw (leg) and Phil Jones (ankle). Liverpool will be thankful enough, as Nathaniel Clyne, Daniel Sturridge and Philippe Coutinho are all expected to return to Klopp’s line-up after starting Sunday’s win at Crystal Palace on the bench, though Christian Benteke – who scored the winning penalty at Selhurst Park – will also be pushing for a recall. Lucas Leiva (thigh) is out.  Rooney (176) has overtaken Arsenal’s Thierry Henry (175) as the scorer of the most goals for a single club in Premier League history.  Rooney has scored in four successive games for United for the first time since March 2012.  Liverpool have conceded more goals from corners than any other team in the Premier League this season (7).  United have scored with all four of their shots on target against Liverpool this season in the Premier League.  Liverpool’s failure in the last game against United, ended up with the Reds unable to find the net. That game ended an eight-game Premier League run of scoring at Anfield. It is the first time under Klopp they have not scored at home.  Van Gaal has won all four Premier League games against Liverpool. United’s midfield in the last two matches has been impressive, especially when it comes to Morgan Schneiderlin, in particular. A look at the side’s results without the 26-year-old show that he has become United’s most important player in his debut season at the club. Without the France international in the side, United have lost nearly half of their 18 matches but they’re losing just 1 in every 13 matches on average with Schneiderlin in the side. In the game against Watford, for example, Schneiderlin was sublime. Between side-stepping opponents in his own half of the pitch and switching long diagonal balls out wide to Guillermo Varela, this performance showcased Schneiderlin’s importance to this United side. When United started ticking — especially once Marcus Rashford moved out right as Anthony Martial came more central — they hit Watford where it hurt with pace and width. Although he missed a crucial penalty in Liverpool’s Capital One Cup final defeat to Manchester City at Wembley, Lallana put in a man-of-the-match worthy performance to help the Reds to a 3-0 revenge victory. Lallana’s performance in the game against Manchester City, was absolutely outstanding. He was involved in all three goals. Performing with grit and determination off the ball, Lallana took a more decisive approach in attack, looking to move play forwards quickly, rather than lingering in possession. Proving his credentials as a match-winner in that game, Lallana must now strive to continue with this form, as his form can be a crucial aspect of Liverpool’s performance as a team. 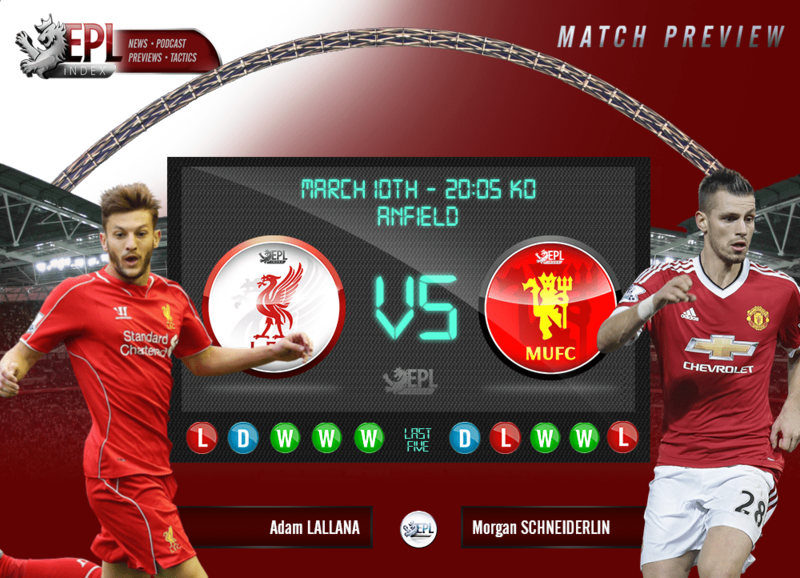 The match is likely to end up in a 3-2 victory for Manchester United over Liverpool. The Red Devils might be plagued with injuries, but as proved in the games before the dismal game against West Brom, the youth team did prove to be a solid answer. As far as Liverpool is concerned, they will be looking to avenge the losses of the last few games, thereby leading to an intensely exciting match. Categories: EPL Index Featured Article, EPL Index Match Previews, Liverpool, Liverpool (NN), Manchester United, and Manchester Utd (NN).' 'Tags: "Manchester United", adam lallana, Adam Lallana Stats, Europa League, Europa League match preview, LFC, Liverpool, Liverpool (NN), Morgan Schneiderlin, and MUFC.